To attract organic traffic, you must both provide quality content for users and translate that information for search engines. While this may sound daunting, you don't have to be fluent in SEO to make these changes. Follow these directions to add on-page SEO best practices to your short-term rental website in minutes! Two of the most important parts of on-page SEO are metadata and on-page content. In this two part blog post, we will supply step-by-step instructions on how to add these two elements to your website, analyze your content using free online tools, and what best practices you should employ to rank for your chosen keywords. Today we will touch on what metadata and on-page content are, why they matter, and provide a tutorial for how you can add them to your short-term rental website. If you would like a full debrief on SEO specifically for short-term rental property managers, download the free MyVR SEO eBook by clicking the button below. Page titles, meta descriptions and other markup data like schema.org are key for SEO success. If you don’t yet know what these are - don’t worry - we’ll cover them! What is on-page content? On-page content is what it sounds like; it is all of the content and HTML source code on a specific page. But why is it so important? Google loves written content. While having high-quality images or videos on your website is great for conversions and showing off your rental, Google prefers to use text to rank pages. Most importantly, search engines want to rank relevant websites and content. If you have a restaurant guide on your website and also a general “things-to-do” page, we want each page to rank for a completely different search. Once you have chosen the correct keywords for your website, it’s time to format them using SEO best practices! Sitewide page title / HTML title - think of this as your first impression for both Google and users that might click on your website. Typically you should make your title tags around 62 -68 characters long to prevent them from being cut off. Sitewide meta description / website description (shown under your website link/title in search results) describes the content of the page which shows why your link should be clicked over others. Typically you should make your metas around 140 - 160 characters to prevent them from being cut off. This helps us set the foundation for our homepage to rank for “cabin rental in Whitefish” searches and the description should entice a guest to click on our website in the Google search results. 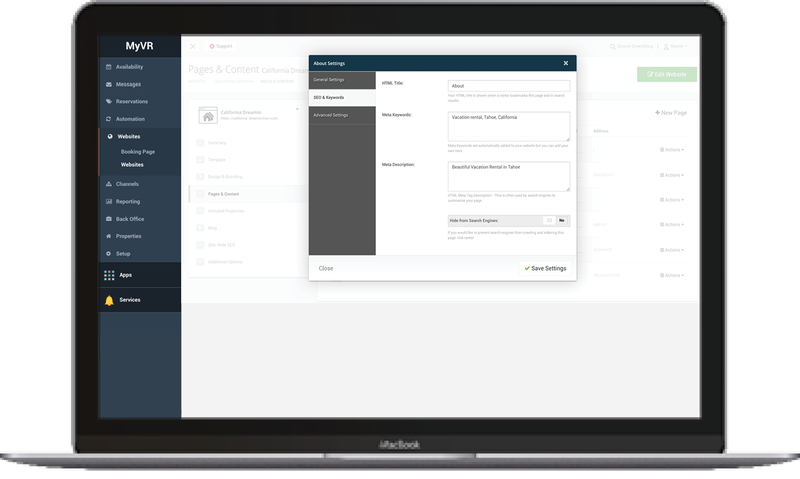 You will need to implement these no matter what platform or CMS you use to host your website. For example, on WordPress you can download the Yoast SEO plug-in to add in title tags and meta descriptions. Now, let’s walk through how to use the SEO tools on the MyVR backend. 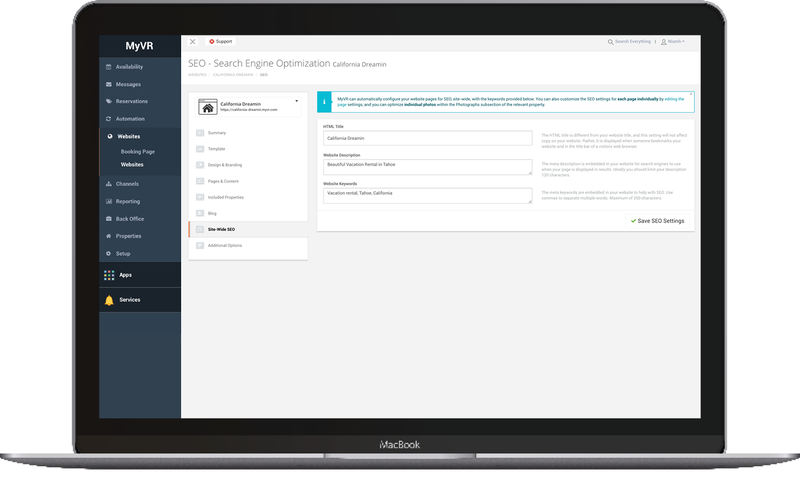 On the MyVR platform, all of the tools are in-place to set up this important area of your on-page SEO. No extra plug-ins or configuration needed! Within MyVR, you can also customize each page individually to have a unique title and description. For example, if you have a “things-to-do” page, a title and description can be written for that page specifically. These same adjustments apply to property pages as well; if you have multiple properties in place on your website, you’ll want to update the SEO information for each property. After setting up on-page SEO on your homepage, the next steps are applying what you learned here to other pages that could attract search engine traffic to your property management website. In part two, we will cover on-page SEO best practices and how to perform a free on-page SEO analysis so you know exactly which pages need attention. 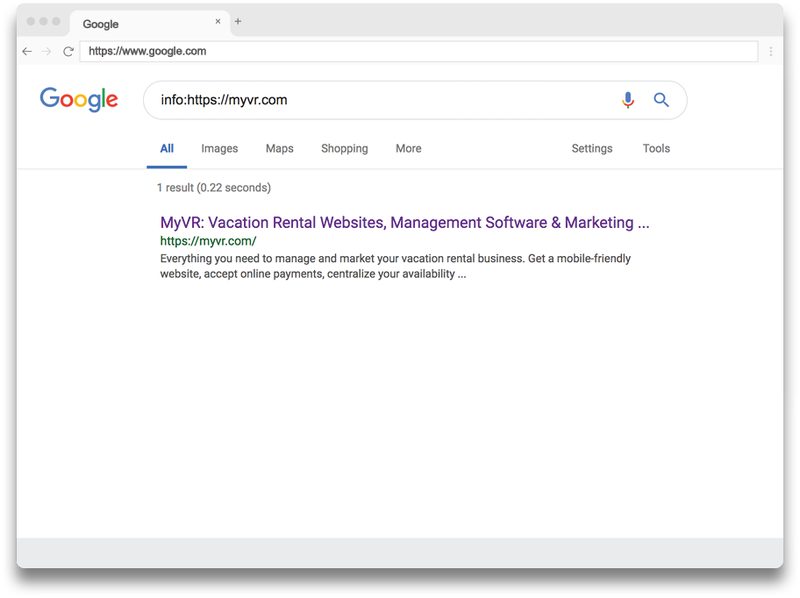 To learn more about driving organic traffic to your short-term rental, download the free MyVR SEO eBook to get started!